When you need garage door repair services in Suwanee, you probably go to Google and type, “garage door repair near me” or “garage repair near me.” Although these search terms yield a lot of results, it’s not necessarily easy to narrow down your findings and select the best company to work on your garage door. And chances are, if you’ve made your way to this blog, you’re wondering how Nabors Garage Doors sets itself apart in the Suwanee garage door industry. Keep reading to find out and give us a call today if you have any questions. First and foremost, Nabors Garage Doors places a heavy emphasis on our local Georgia community. For years, we’ve served Suwanee, Peachtree City, Woodstock, and surrounding areas with quality garage door repair services because we believe that when it comes to garage doors, what’s good for homeowners is good for the community. As homeowners, we spend a lot of time searching for the right companies to provide renovations and repairs on our home, and when they turn out to be a scam, it can be really frustrating! As your locally owned and trusted garage door repair company, you’ll never have to worry about that with us. We’ve all been in a situation where we need emergency home repairs and don’t know who to call. 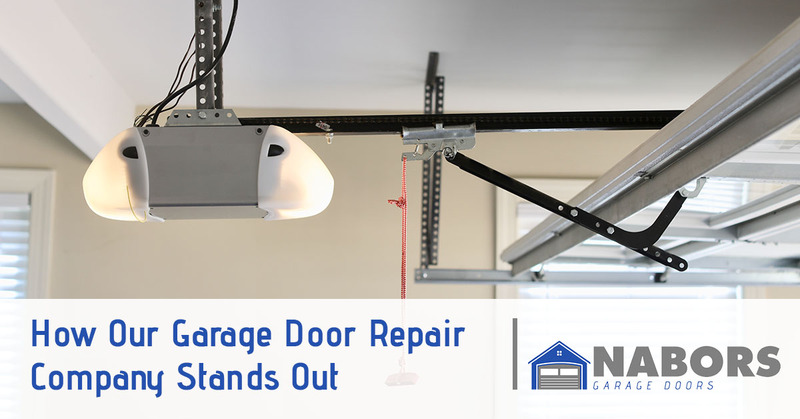 A number of garage door emergencies can arise like a broken track, spring, garage door opener, or maybe the garage door itself was hit by a car and needs emergency repairs in order to keep your home safe and secure. Nabors Garage Doors is available 24/7 for a free consultation, and if there’s an emergency, we’ll get to your home as quickly as we can. One thing many homeowners struggle with is avoiding large corporations who have one goal: to upsell. Fortunately, at Nabors Garage Doors, we don’t play that kind of game. After inspecting your garage door, we will be 100 percent transparent about its condition and what repairs will be needed to get it working again. If you’re looking for new garage door installation, we’ll help you narrow down your options, finding the best garage door for you at the lowest price point in the industry. Our goal is that you will return to us anytime you need garage door repairs, garage door replacement, or garage door opener installation knowing that we will get the job done correctly the first time. There’s no need to keep Googling “garage door repair near me” everytime you need to speak with a garage door contractor. Add Nabors Garage Doors to your contacts, and give us a call anytime you’re having trouble with your garage door or are thinking about replacing it altogether. We offer a large selection of garage doors including traditional style Amarr steel doors, carriage house doors, and specialty doors. Give us a call for a free consultation.